It can be both startling and surprising when I meet Christians (or engage with Christians online) who, for all their talk of Christianity, can’t seem to make sense of the Bible. How could this be? How could it be that we would become so disoriented in our own worldview that our own book wouldn’t make sense to us? 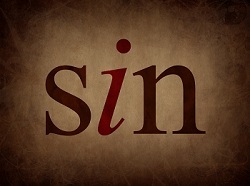 JI Packer describes one prominent reason one reason why the Bible doesn’t make sense to people: they don’t understand sin. ‘The subject of sin is vital knowledge’ indeed. May God make us faithful to study it, know it, read the Bible, and relate to our God in light of all that he has shown us about our sin. Have you ever wondered how it is that some people seem to be so intrigued by their horoscope? 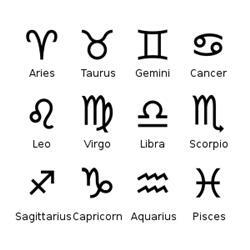 I think we all know at least a few coworkers, friends, family members, or neighbours who interpret all of life’s events through Zodiac signs. It’s weird, right? But they get so excited to read the horoscope! They are eager to read it because they really want to find out what their future (and everyone else’s future) seems to have in store. And they really believe they’ll find out here. The sad thing, to me, isn’t just that they’re reading these fanciful, generic, basically-could-apply-to-anyone, type predictions. What’s actually sad is that they are more excited about reading the horoscopes (and seem to benefit from reading them more) than some Christians are about reading the Bible. But the Bible is the inspired Word of God! How could this be? Someone might answer that it’s hard to benefit from reading the Bible because it is harder to understand. That may be true, in part. But there are lots of easy articles and books devoted to helping you understand the Bible, and many great study Bibles that you can take advantage of as well. Understanding doesn’t have to be (and typically isn’t) the issue. I think the difference is faith. Expectation. Anticipation. Hope. The difference between horoscope readers and Bible readers, much of the time, is that horoscope readers, sadly, often read with more faith. 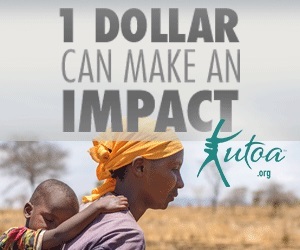 They genuinely believe that something in those pages will make a difference in their life. The Bible is awesome. So Christians love it. Unfortunately, the Bible is also huge compared to blog posts, tweets, and most other things we read these days. So Christians fear it. About a month and a half ago I decided that I wanted to start a new Bible reading plan. From the list of thousands available, one stuck out to me: The Bible in 90 Days. Read through the Bible in 90 days? I wondered what kind of an insane idea this was, so I looked into it a little bit. Surely, it must be impossible, right? So, to read the whole Bible in 90 days, you need to read about 48 minutes per day. Yeah, it’s a commitment, for sure. But really, it’s no more than watching one prime time TV show per day. Or one-third of a sporting event per day. Those are things that we do every day without blinking! So why not give it a shot? I’ve been at it for a while now. And I can honestly tell you that I don’t think I’ve ever done anything as a Christian that has reaped more immediate benefit for my soul. I’m over halfway through the Bible now, and rather than fearing my Bible reading, I’m loving it! Spending the extra time in the word each day has hooked me and formed a solid habit; I’m honestly addicted. I’m looking instinctively now for ways to spend more time in the word — I love it! 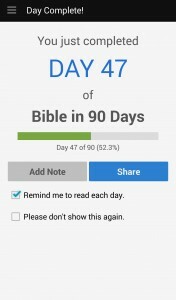 The YouVersion app has been super-helpful for reminding me and tracking my progress. I totally recommend getting it, if you don’t have it. So GFC people, look out! Once I’m done this time through the Bible, I’ll be looking for some of you to do it with me! Everyone loves a good story, right? And they’re always easy to understand, too… right? Or maybe not so much. When we move into New Testament Narrative as a genre (basically consisting of the Gospels and Acts) we move into some of the most familiar and most beloved portions of Scripture. New Testament Narrative may best be described as ‘Theological History’ or perhaps ‘Historical Theology.’ The term Gospel simply refers to the proclamation of good news and was typically associated with things like military conquest or the birth of a son. While each Gospel-writer has his own purpose for writing, and therefore his own themes, we need to be familiar with big themes of the Gospels & Acts (kingdom, authority, end of the age, revelation of God, etc.). In particular, we want to see how each is deliberately trying to portray Jesus as the fulfilment of all humanity’s needs and all the OT’s expectations. In some sense, these are proverbs in narrative form, contrasting how different people live before God (wise & foolish builders, pharisees/Levites & Samaritans, rich man & Lazarus, Pharisee & tax collector). Back in the summer I began a series giving some ‘Guidelines for Reading the Bible.’ At that time I covered Old Testament Narrative and Wisdom Literature. Today I’d like to move on and cover the Prophetic Literature. These books may be divided up into their three main redemptive-historical categories of pre-exilic, exilic, and post-exilic (all referring to the Babylonian exile of 605-536 BC). All of the writing prophets have their ministry span falling between about 760 and 460 BC. Just like your pastor’s message to your church this coming Sunday will be different than the message preached to our people (addressing different sins and different cultural pressures, etc. ), the prophets were addressing different people groups (either Israel in the north of Judah in the south). It’s important to know where and when these prophets are ministering so you can make sense of their warning / admonition / rebuke. A good study Bible will always help you here. Often when we conceive of prophecy and prophets we think merely of future-telling. But there is much more identity-grounding memory-jogging in the prophetic literature than anything else. As historians, they were to remind God’s people of their covenantal past and all that God had already promised & warned. But inasmuch as they reminded people of what God had said in the past, the prophets could predict the immediate future (because they knew God would keep his word to bless & to curse appropriately). The prophets saw the future events of the ‘last days’ as a mountain range in the distance, as one singular unit. Living in the ‘last days’ now, however, we see that within the mountain range there are many peaks and valleys between individual predicted events. The Poetry (e.g. Isaiah 52-53); also, proverbs, riddles, satire, etc. Who doesn’t want to be wise? Everyone wants to be wise! No one wants to make foolish decisions that they will later regret. And Christians especially want to know how to make decisions that are pleasing to the Lord. That’s why we have the wisdom literature in our Bible (for my purposes here, I’m lumping in Job, Psalms, Proverbs, Ecclesiastes, and Song of Solomon, all in this category). These books are given specifically so that we could know how to live wisely. But the problem is that when we pick up these books, we’re often filled with more questions than answers: How come these statements aren’t always true in my life? How come some back-to-back statements seem to contradict each other (Prov 26.4-5)? What are all these strange forms of sayings and strange images? How is someone ever supposed to live on the corner of a roof anyway (Prov 25.24)? Here are ten hopefully helpful principles for interpreting Wisdom Literature. It’s important that we get this right, since this is God’s means of helping us to become wise. If you’ve ever begun to read through the Old Testament and been filled with more questions than answers, you’re not alone. Many of the stories of the OT are hard to understand and hard to apply. We know that narratives are inspired and ‘useful’ for us (2 Tim 3.16-17), but how? Are we really supposed to cheer on Samson? Are we always supposed to take Abraham as a positive example? Are we really supposed to take the admonitions of God to Joshua as personal words of exhortation & promise to us? Here are ten hopefully helpful principles for interpreting Old Testament narrative. It’s important that we get this right, since this genre of Scripture makes up about 66% of our whole Bible.